The idea: Use AppleTVs as inexpensive digital signage units. Activate all the Apple TVs not he same iCloud account. Enable Photostream on the account. Use a designated iPhoto library for uploading the photos to the stream, we use a workstation as of now. ideally shared photo streams would be better for us as different users could upload images for the signage. On the Apple TVs a internet connection is needed to sync to the cloud. Photos do not buffer unfortunately, and an active connection is perpetually needed. Here is an information flow. 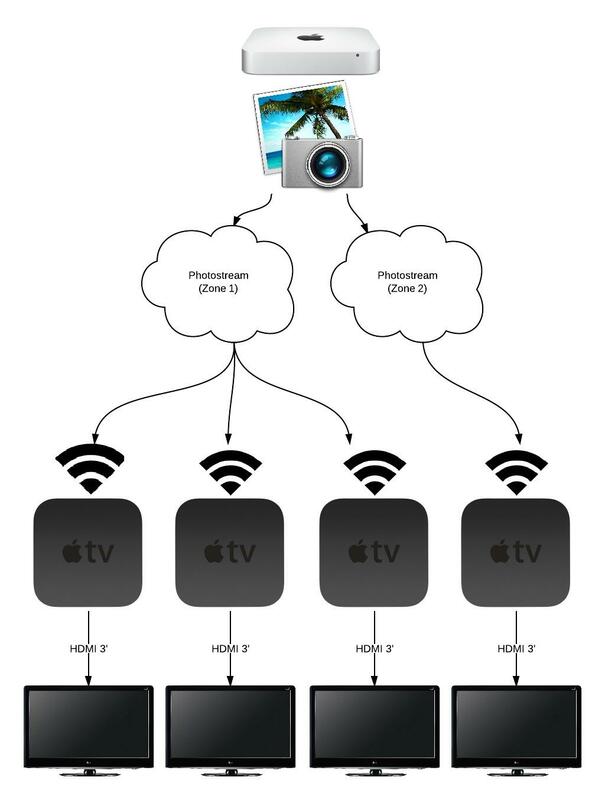 Apple TV’s are secured to the TV mounts in the ceiling via Innovelis Totalmount, and are connected to the TVs via a 3′ HDMI cable. Apple Remotes come with the devices, but I currently use Apple’s Remote on the App Store, it’s free and works well 80% of the time, and you don’t have to carry around 8-10 remotes. This system has been in place for over 6 months, with infrequent issues or troubleshooting needed. 8 Apple TVs are currently in use and only require attention when a new update is released. Price compared to any other competition is extremely comparable. It’s a simple slideshow, but our organization doesn’t need twitter integration or some of the flashiness of professional grade digital signage. An unforeseen benefit was anyone subscribed to the photo stream would receive an update when a new image was added, this was beneficial for administrators and those responsible for proofing any images could then proof at their leisure on their device. Looking to host this system on a local subnet, more off a Mac mini running a shared photo library, not being dependent on the internet services. Will post if I ever get to this. Zonal signage, can easily be implemented by different Photostreams per zone and uploaded accordingly. What I’d give for some ssh capabilities. Remote access via a machine to customize device settings, call me a dreamer.